‘Come see me shape the lime wood. Discover the shapes created from designer’s imagination and my hands working to make them. Come and smell the fragrance of the wood shavings. This craft of mine needs people to find out all about it. I'm waiting to see you..’ says Didier Laforest. New to Causssade - the city of hats! Welcome to Caussade and now, most importantly, to the workshop, shop and showroom of Didier Laforest. A magical place embodying the very spirit of wood, felt and straw in premises, planned, designed and managed by Didier himself. Didier is a Hat Blocker! What’s a Hat Blocker? Well you may not have considered this before but this trade is actually critical to the manufacture of hats. 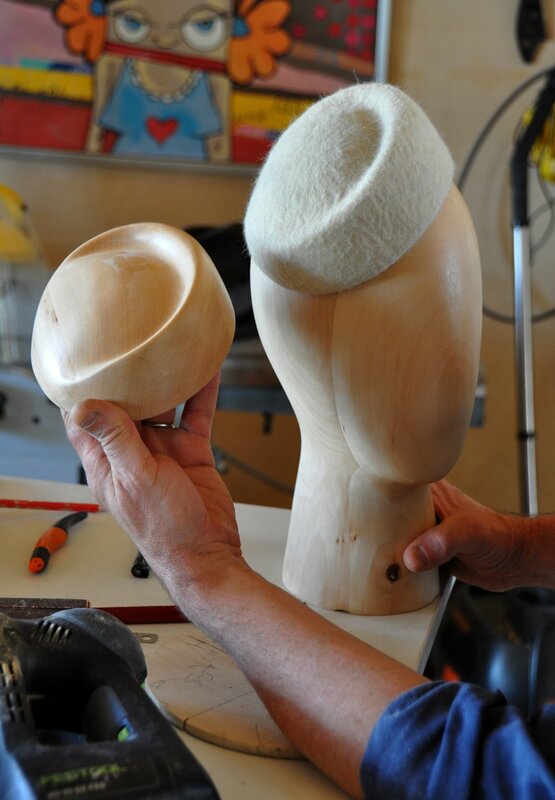 They create, with great skill, the wooden formers on which hats are made. It’s listed on UNESCO’s list of ‘Rare and Exceptional Crafts’. It is also hugely important that the skill is preserved as it is integral to the fashion industry and France’s international millinery influence. A hat blocker carves blocks of lime wood to create formers for any type of hat, from straw, beret, bowler or even cowboy. It’s a much more complex process that you might first think. It requires many skills including a knowledge of sculpture, cabinet-making, filming, drawing, shaping, design and a great understanding of the milliner’s materials. This year has seen real change for Hats Blocks Laforest, with a move from Chazelles sur Lyon (the city of felt hats) to this region and its hat production centre, Caussade. The business is now installed in the town’s old quarter, close to the fountain of Thouron and the church, occupying a 13th century building which is brimming with history. There are three elements to Didier’s business. Firstly, the workshop which is fully operational, machines installed, wood ready for use, with gouges, saws and many other, often peculiarly named, tools. A great way to know the workshop definitely in use – there’s a lovely aroma of lime-wood shavings. Then, secondly, there’s a hat shop with a design inspired by the interiors of hat manufacturers’ premises. 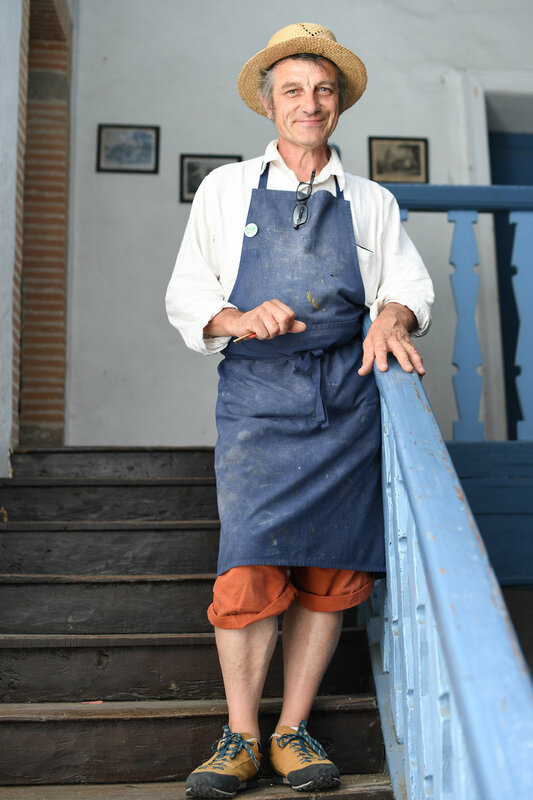 The shop will be stocked with carefully chosen hats created by Didier’s milliner friends and regional producers. Thirdly, in order to be able to celebrate the history of his craft and the beauty and history of hats Didier’s has created a show room. A place to present his lovely array of wooden hat blocks but also a place to house historical displays and exhibitions. This year it’s the 25th ‘Estivales du Chapeau’ in the town of Caussade (see p.22). Each year between 50 and 70 milliners from all over the world come together in Caussade for a week. There are parades, demonstrations, competitions, visits to hat manufactures, musical events and a prestigious evening of parades, competition and awards. This summer, to coincide with the ‘Estivales de Chapeau’, Hats Blocks Laforest will be holding an exhibition of rare and special hats. An exhibition made possible because of the collaboration and close working relationship between Hat Blockers and milliners enabling a great selection of exhibits to be brought together. If you are at the Estivales this summer do try to find Didier and his exhibition. A chance to find out more about being a hat blocker and to share his great passion for all things ‘hat’. 82300 Caussade Tel: 06 59 25 23 53.